It was a sticky-hot day in July 2013 when Susan and Gene Massamillo stepped into a Tradd Street backyard, real estate agent in tow. 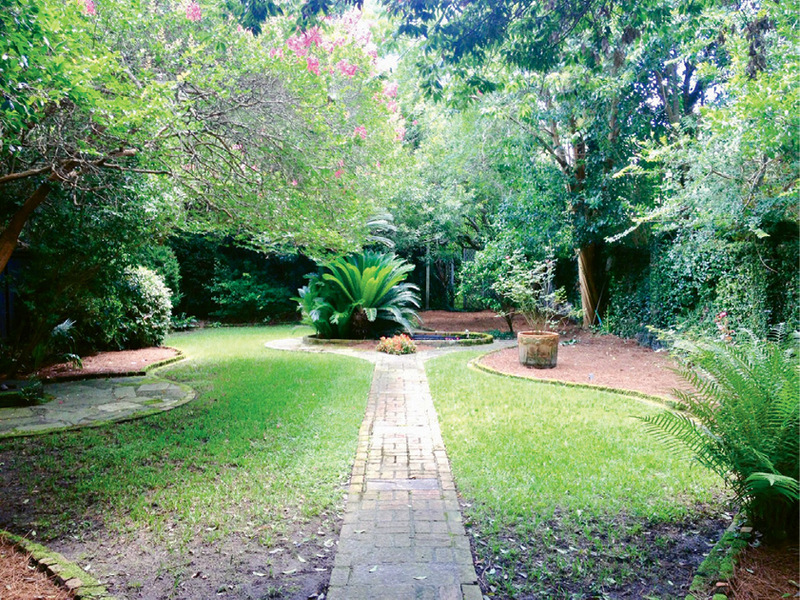 They followed an old brick path down the middle of a sparse lawn, around a towering sago palm (a century old, it turned out), to a lattice fence overtaken by jasmine. Gene pulled open the gate, and there—in South of Broad’s well-manicured midst—grew a wild expanse of trees and vines and weeds. “We looked at each other and said, ‘This is it!’” recalls Susan, a Garden Club of America member who was itching to dig into a downtown green space. 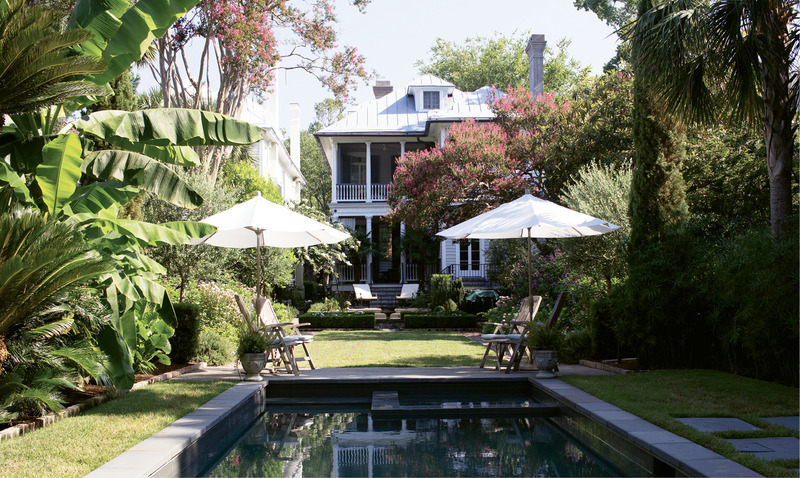 The Massamillos purchased the “sunny and happy” Tradd Street house, and Susan set to work sketching her plans for the backyard. 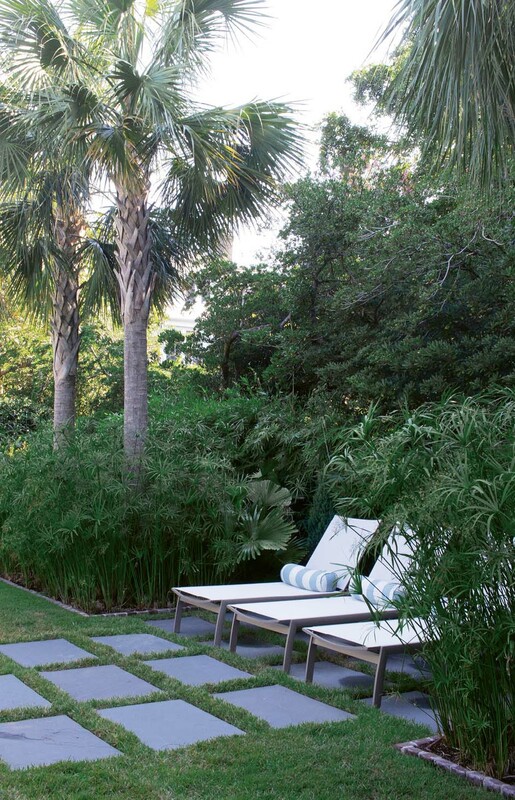 The pair then turned to Sheila Wertimer of Wertimer + Cline Landscape Architects to bring those ideas into reality. “I told Sheila that my idea of a garden is a place that will transport you,” says Susan, now looking out on her oasis from the most-used room in the house: the back porch. 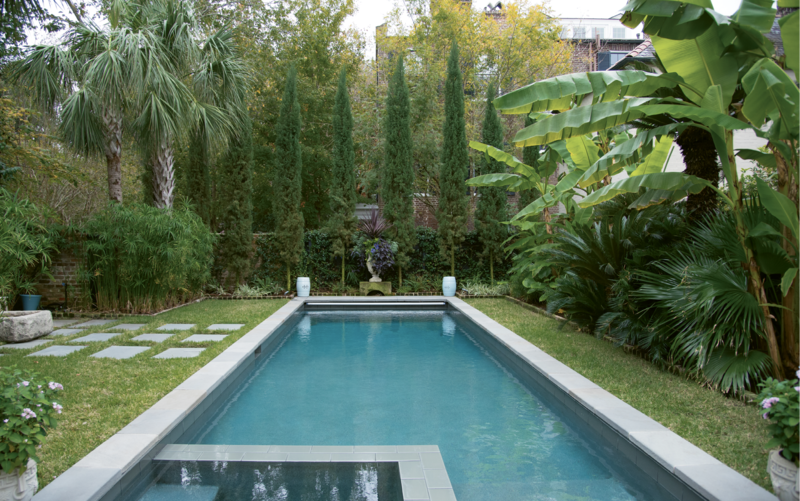 She and Gene specifically wanted to invoke memories of their favorite destinations—France, England, and Italy—and the many gardens they’ve toured there. 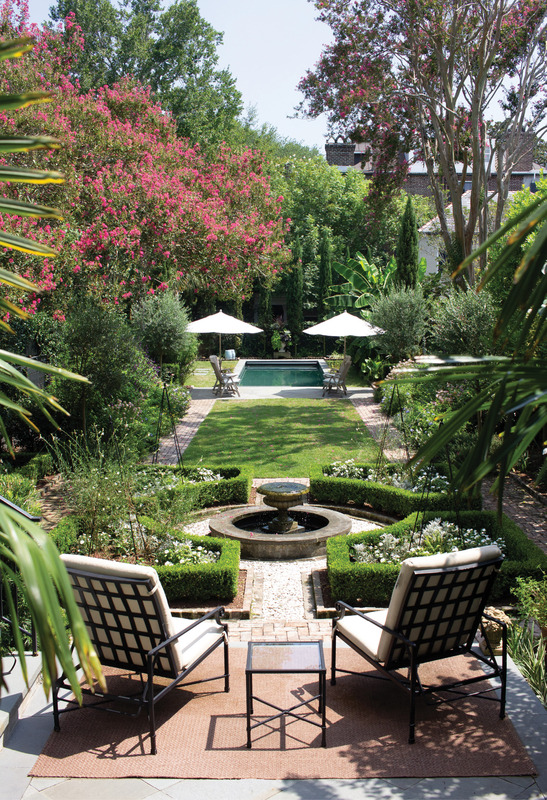 A bluestone patio leads down to a French-style parterre centered around a fountain that Susan loves for its quiet splashing (not to mention the singing frogs it attracts in the summer). ‘Winter Gem’ boxwoods outline beds that she fills each season with all-white annuals. 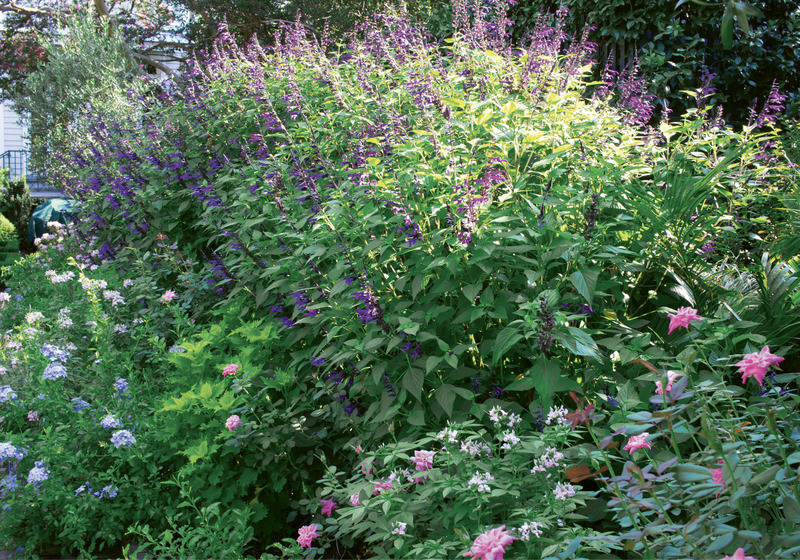 Last year, she let gaura burst above impatiens and artemisia, inspired by British landscape designer Russell Page, “who liked to have wild gardens contained like unruly children within clipped hedges,” Susan explains. The pale flora glow in the dark, enhancing the Massamillos’ view during evenings on the porch. 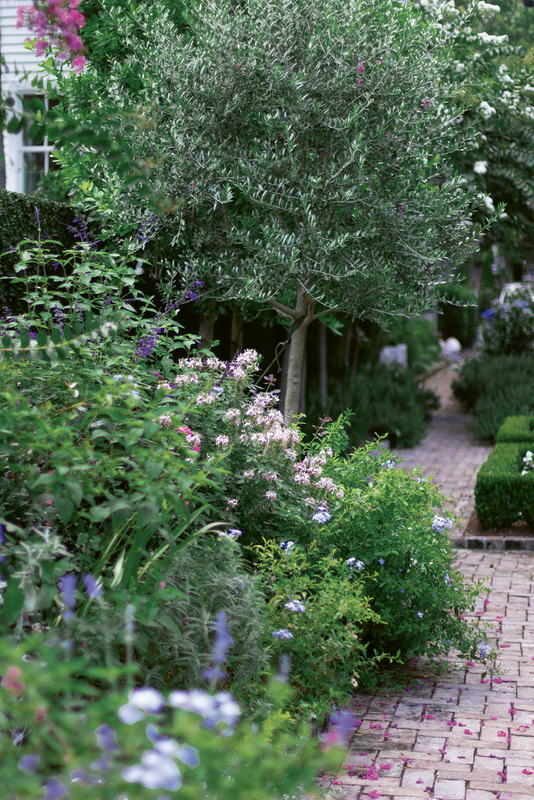 The parterre also cleanses the visual palate, notes Susan, before the room that comes next, its beds erupting with blooms on either side of a lush lawn. “I’ve always wanted a perennial garden that’s viewed sideways, so you don’t notice the empty spots,” she says. Wertimer delivered, creating a backdrop of sasanqua camellias, then layering in pink Knock Out roses, blue plumbago, and soft-yellow lantana. Impactful yet low-maintenance, the results would have been perfect for a less hands-on homeowner. “But I like going out to see what’s new each day,” says Susan. 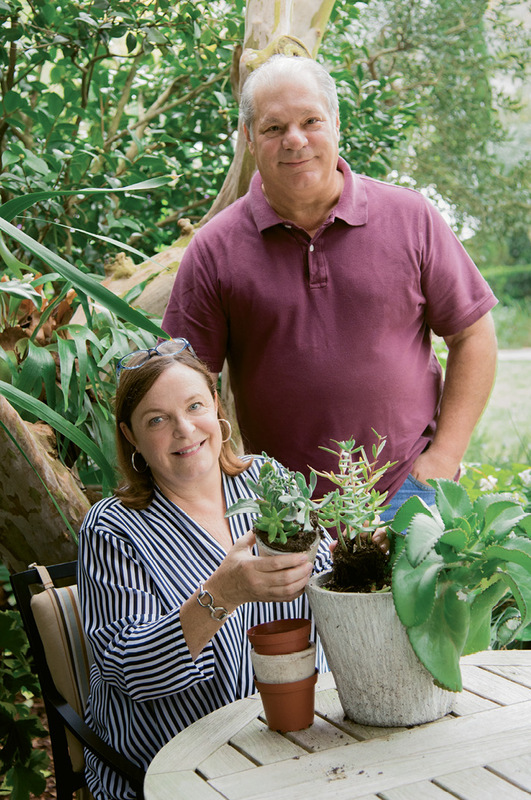 “I realized that not much was changing.” She returned from a 2017 trip to England—where she and Gene visited the Charleston Farmhouse and Sissinghurst Castle gardens, among others—inspired to diversify. 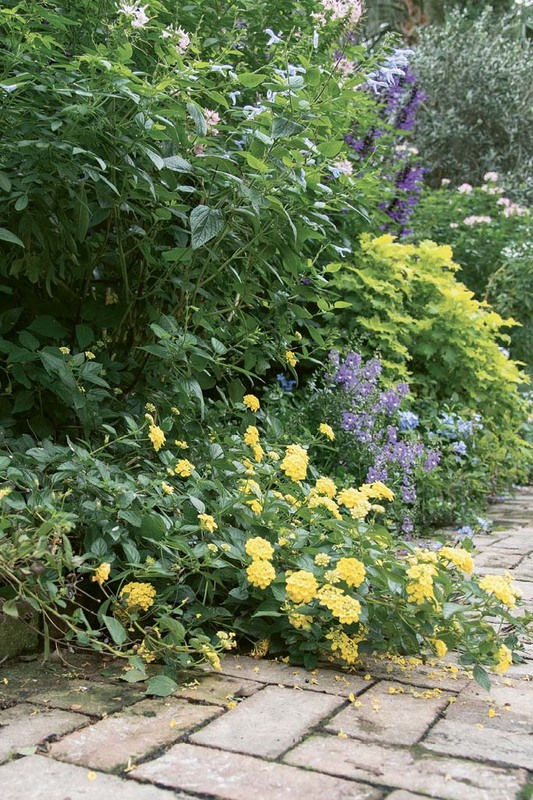 “I started tucking in annuals in drifts, going for an overgrown look, as if things just reseeded,” she explains. Blush-colored cleome reach up toward the purple ‘Amistad’ salvia Susan brought from Connecticut (it bloomed straight through last winter, feeding a crew of hummingbirds who never bothered to fly south). Hot-pink pentas pop against chartreuse coleus, and delicate sweet alyssum is sprinkled among round-faced zinnias. “I enjoy playing with color, contrast, and composition,” notes Susan, who was a women’s clothing designer for Ralph Lauren in the ’80s before turning to a career in interior design. 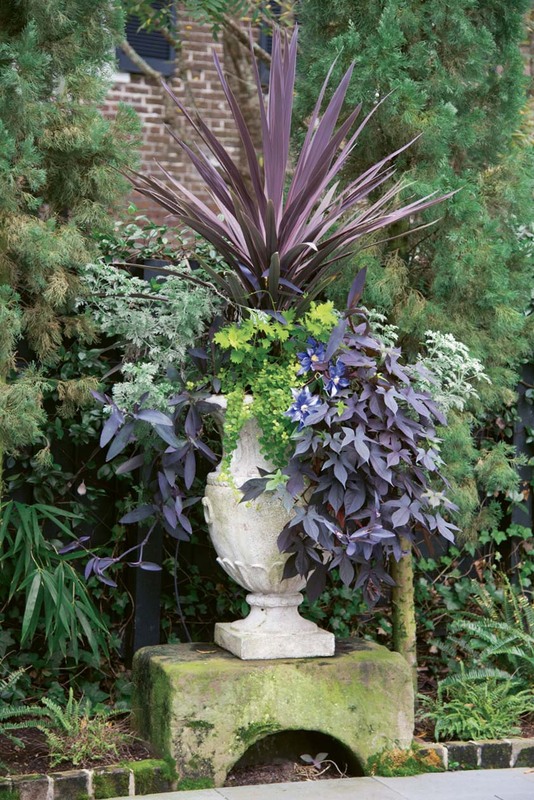 Her English-garden-style display never fails to wow visitors, including those who strolled through last month during the Garden Club of Charleston’s House & Garden Tour. The Massamillos will welcome company again on June 1—this time for their encore performance on the Behind the Garden Gate tour, a collaboration among Spoleto Festival USA, the Charleston Horticultural Society, and The Garden Conservancy. Aside from the vibrant focal point, this space is devoted to cooling greens. Relaxing in lounge chairs tucked into a jungle of papyrus, the Massamillos (whose grown sons, Andrew and Christian, are frequent visitors) gaze across the pool at a textured array of Chinese fan palms, ligularia, that historic sago palm—transplanted from the center of the yard—and impossibly tall banana trees. The heat and humidity is something these Northern transplants have learned to contend with—and embrace. 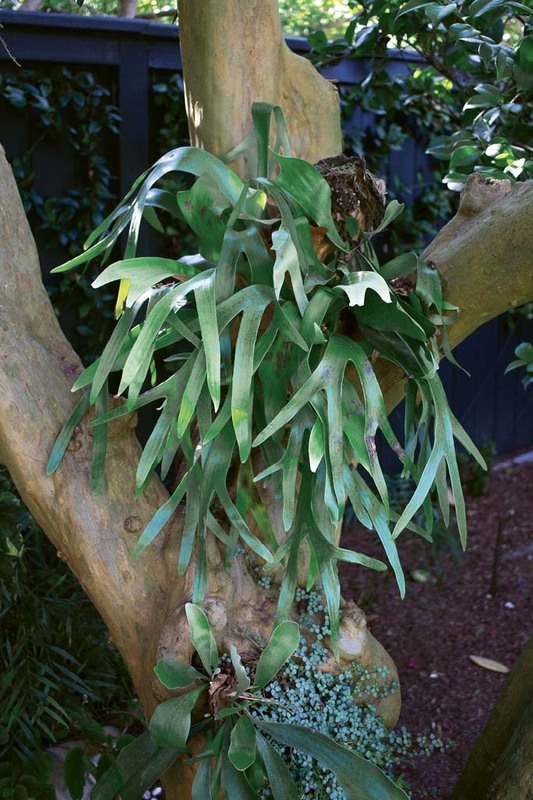 Armed with experience, plus knowledge gained through blogs, books, and many a Charleston Horticultural Society lecture, Susan took on an experiment last July. 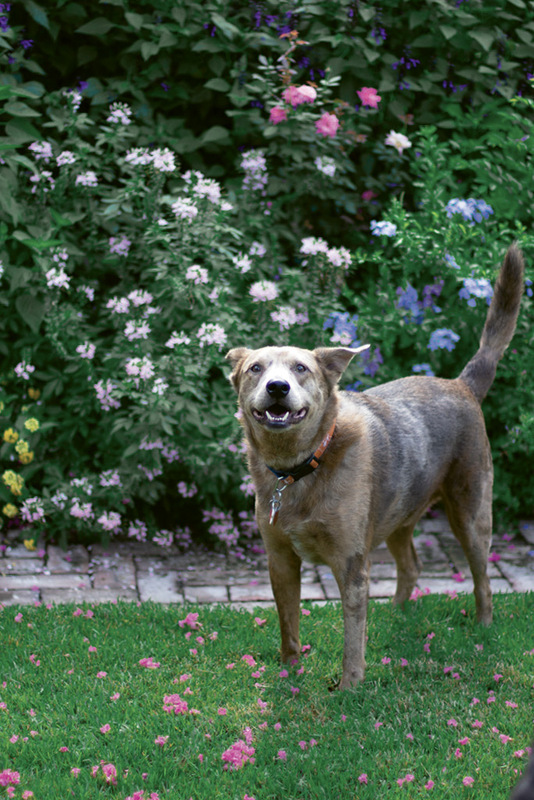 Before she and Gene left for five weeks in Italy, she commissioned their Ables Landscapes crew to help her cut the garden’s perennials and annuals back by a third. They repeated the pruning just after Labor Day, hoping it would lead to something of a second summer come fall. It worked like a charm. When the Massamillos opened their garden for a November party supporting the Nuovo Cinema Italiano Film Festival, and then for guests visiting for the British-born Charleston to Charleston Literary Festival, the salvia, plumbago, and zinnias were blooming like mad. 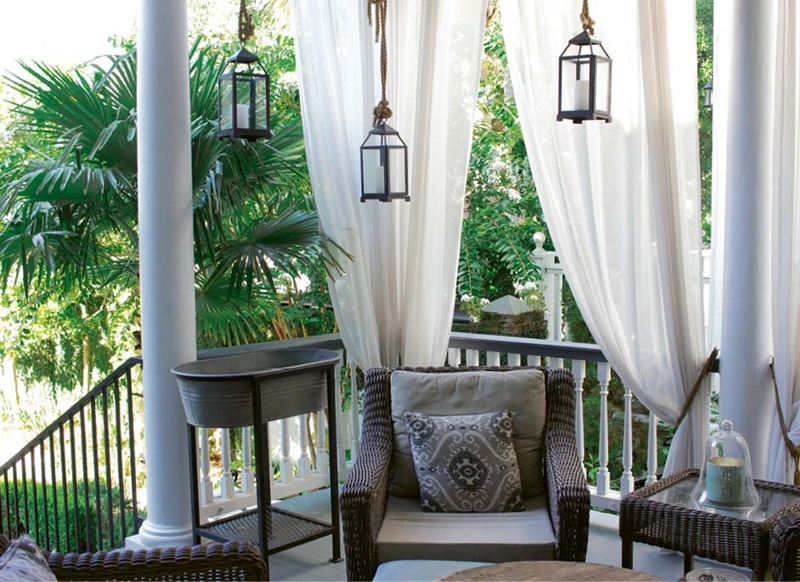 Of course, spending quiet hours on the porch—watching the butterflies float from flower to flower, admiring the play of light on the banana leaves, and chatting future travel plans—is its own kind of sublime for the satisfied Massamillos.